But you can’t help but notice that while people in suits were making dour faces and demanding that Charlie Sheen show contrition, repentence, and general self-abasement, the reaction out in the country was something completely different. Mr. Sheen announced that he would do a one-man show at Radio City Music Hall and tickets sold out in less than 30 minutes. Mr. Sheen advertised for an intern and received, reportedly, 74,000 resumes. 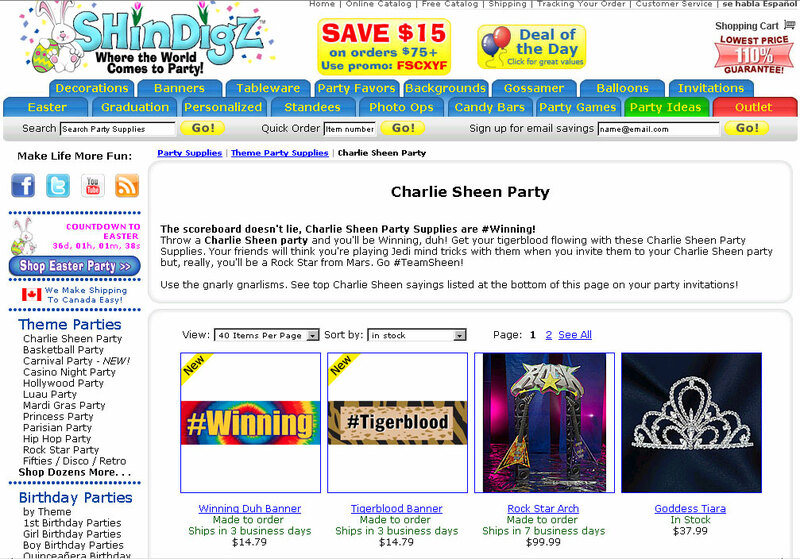 A party supply store offered “Charlie Sheen Party” merchandise alongside its Easter Bunny gear. Seriously. Interested in throwing a Charlie Sheen party? 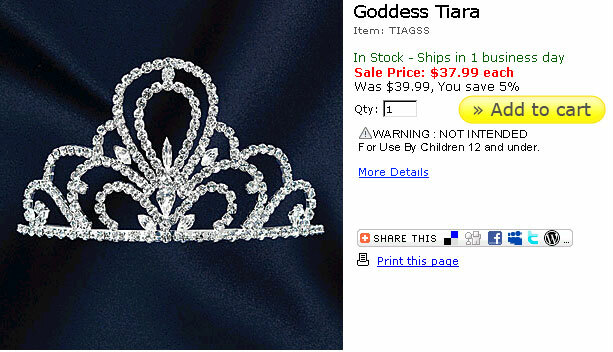 You can decorate the living room with a Tigerblood banner for $14.79 and don’t miss out on the Goddess tiara for $37.99. Buy two of them because, well, you know. Click the picture above to enlarge it. But America Wants To Know isn’t interested in litigation over celebrity name and publicity rights. We’re interested in novelist Ayn Rand’s theory that the official morality of self-sacrifice, which has been taught to all of us from childhood, is secretly despised and rejected by almost all the people who profess to agree with it. We hope Charlie Sheen is well and happy and lives to be 120. We’re not here to debate the health benefits or consequences of whatever he’s done or is doing. We’re interested in why the general population is throwing Charlie Sheen parties, mixing Charlie Sheen Tigerblood cocktails, buying tickets to see him stand on a stage without a script, and applying in droves to be his unpaid intern. “In Sienkiewicz’s Quo Vadis,” Ayn Rand wrote in The Romantic Manifesto, “the best-drawn, most colorful character, who dominates the novel, is Petronius, the symbol of Roman decadence–while Vinicius, the author’s hero, the symbol of the rise of Christianity, is a cardboard figure. Read the whole book. Ayn Rand is worth your time. If you’ve never read her masterpiece novel, Atlas Shrugged, you’ll have an opportunity to take a shortcut next month when the LONG-awaited movie version of the 1957 novel premieres in the United States. Actually, the movie only covers the first third of the book. But it’s going to be worth your time anyway, even though you’ll be exasperated that the movie ends with the mystery unsolved. Take home some popcorn and buy the book.